Thank You Messages For Doctor : A good doctor who works hard to serve humanity and handle with care his/her patient always deserve appreciation. So, don’t ever forget to thank your doctor on Doctor’s Day! Also, if you had successful surgery, excellent delivery service during birthing either the best treatment to fight disease and fast recovery then you should show your gratitude. If you’re not sure what to say or write in a thank-you note to your doctor then you may take ideas from this post. 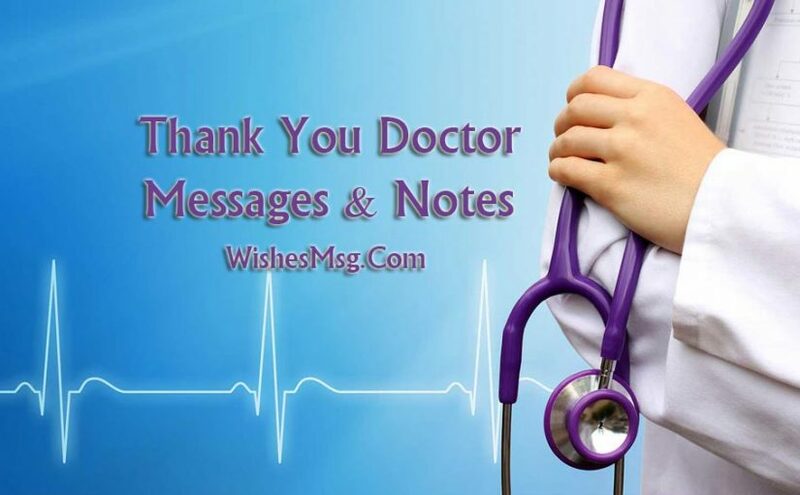 All these Thank You Messages For Doctor and Doctor’s Day Appreciation Notes will make your way easy to show your thankfulness for all the support, dedicated service, care or humbleness and surely the effective treatment. 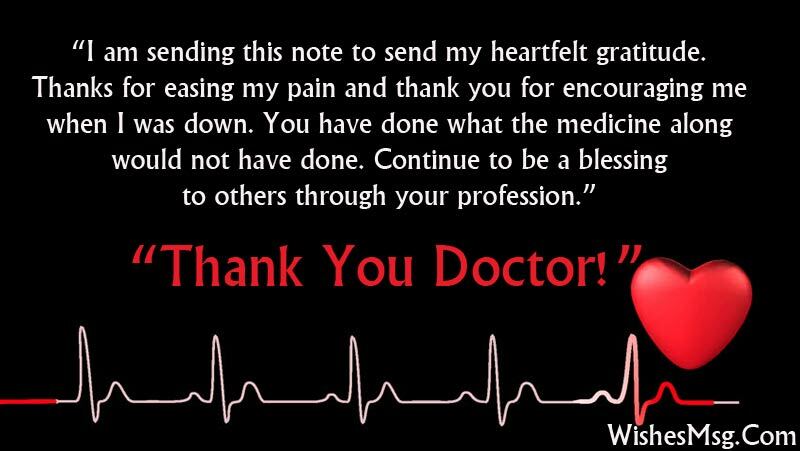 Here is the perfect wording to thank your doctor with heartfelt gratitude. Happy Doctor’s Day. I wish that your days turn to be as healthy and wonderful as you do it for your patients! 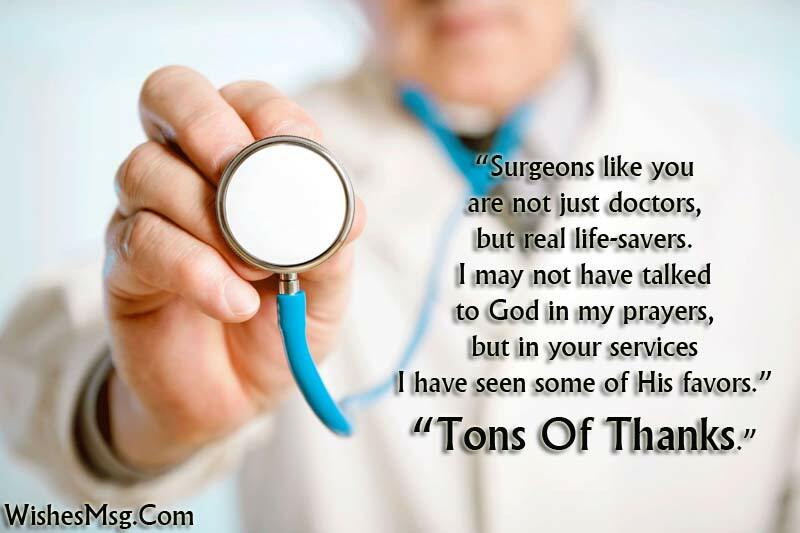 Doctors are the boon directly sent from God for us. Salute to the heroic job you do. Hats off to you! 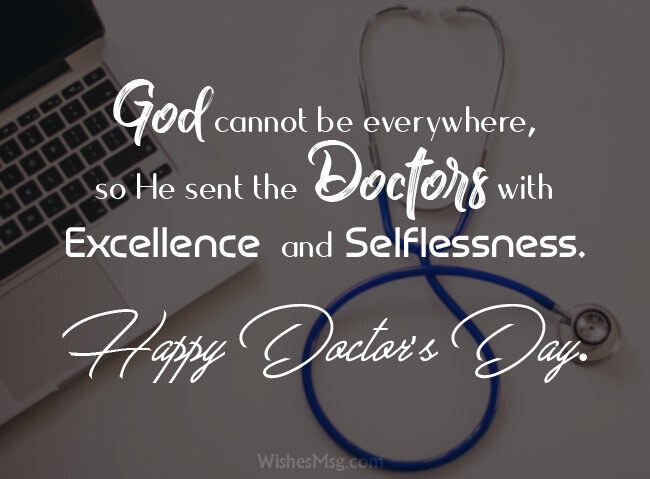 Happy Doctor’s Day 2019. Happy Doctor’s Day. Sending heartwarming wishes to the great physician I’ve ever met. May you have days full of joy. Sending you best wishes from deep down my heart. Your smile heals half of my sickness! Keep it up and hope you do more progress in the future. Patience, tolerance and intelligence, you have all these in you. I’m proud of you and hope you keep doing great in your career. Happy Doctor’s Day. God cannot be everywhere, so He sent the doctors with excellence and selflessness. Happy Doctor’s Day. Happy Doctor’s Day. Along with being a good doctor, you’ve got a great personality that brings warmth and joys to our hearts. All the best to you, Doctor! Maybe you’re a good doctor with your practice, but you’re a great doctor when you realize what’s your responsibility better than business. Happy International Doctor’s Day. When you’re sincerely ready to help others, you’re on the way to be a great doctor. Salute to all doctor’s for self-sacrificing for us. Happy World Doctor’s Day. Happy National Doctor’s Day! Sending this pretty carnation to the great doctor with an amazing personality and high ethics. Sending you our heartfelt thankfulness for caring and comforting. Your presence holds a positive vibe that is more powerful than your prescribed medicines. Thank you so much for doing a great job for us. You’ve always been successful to keep our spirits up and maintaining good health. No matter the illness is, against a doctor like you, they get no chance. Thanks for being such a kind doctor and being patient all the time. Sending my gratefulness to the best doctor I’ve ever seen. You’ve given me a new life. Thank you for your excellent treatment and also grateful for your friendly staff members. To me, you’re a magician, a great physician, a special gift from God. Thank you so much for all your contribution and efforts that you do to keep us well. Countless thanks to the entire doctor’s who are working day and night for keeping us in the pink of health. Wishing them heartiest gratitude for their greatest contribution. Not many people have a chance to say they have as great of a doctor as I do. Thank you for everything you’ve done for me and I’m so happy I’ve found a doctor like you. Medicines can cure, but a good doctor’s inspirational words can give the strength to fight from within. Thanks for doing just that. Your wonderful treatment and loving care have shown results doc. I feel as fresh as a daisy now bursting with good health. You deserve my heartfelt thanks. May the Lord shower His blessings! An apple a day keeps a doctor away. But who wants to keep good doctors like you at bay? Thanks for helping me out doctor. You’re such a wonderful doctor and you always make me feel so safe. Thank you for being the best doctor for me. It wasn’t the medicines, but your reassuring words which gave me the strength to pull through my illness. Thanks, doctor. Being in a hospital is a terrible experience, but you made me feel like home. Your caring and extra effort to make your patient comfortable is truly remarkable. Thank you, Doc! You’ve been such a kind and caring doctor for me during my time of need. Thank you for doing everything that you do and helping me during a hard time. I want to thank you from the bottom of my heart for the warmth with which you treated me to good health. May God bless you doctor. I am sending this note to send my heartfelt gratitude. Thanks for easing my pain and thank you for encouraging me when I was down. You have done what medicine along the would not have done. Continue to be a blessing to others through your profession. No words are enough to appreciate the service you do. You as a doctor and the staff at your clinic has been really helpful and supportive. Thank you for all your service. As a doctor, you’ve gone above and beyond everything, I ever would have expected. The world would be a much better place if all of the doctors were like you. Thank you so much for everything that you have done. Because God could not be everywhere he made sure that we have doctors like you who have the gift of healing mankind. I am so thankful to you for treating me so tenderly. I feel very healthy now. Thank you so very much. A patient’s testimonial is less of a recognition of a doctor’s professional expertise, and more of a recommendation of a doctor’s ability to listen, care and heal. I can vouch for the fact that your abilities are unmatched. Thanks, doctor. Any doctor can prescribe, but only a few good ones can really heal. You are the latter. Thanks. You always made me believed that I can recover from this illness and I did. Thank you for your medical, mental, emotional, and spiritual unwavering support. I always appreciate all your help and support to me! Having a doctor like you is something that nearly everyone wants, but many people never get to experience. You’ve been so good to me and helped me through all of this time. Thank you for being the best doctor! Your great explanation of my illness and giving me hope that I can recover gave me the strength to face this life’s challenge. Knowing that you are my doctor, I feel safe. My trust and confidence are always with you. I sincerely thank you for making me feel at home when I felt uncomfortable in the hospital environment. I believe that you are one of the best doctors in the world. God bless you! Doctors are always busy and in a hurry, but whenever I visit your clinic you give your sincere and undivided attention. Having an appointment is always worth the visit. Thanks for your humble cooperation! Thank you for being so much more than I ever would have thought I could find in a doctor. You’re an amazing person and you’ve made such a difference in my life and I will be forever grateful to you. It’s the little things that matter to most people and you have done so many little things for me that make me know you care about your patients. I am so grateful for the things you do. Thank you for being a wonderful doctor. Thank you for being a wonderful doctor. Being new to the method of natural delivery, I was nervous, but you have proven that this is the best for me and I love it. Thank you for your exceptional patience and professionalism you’ve shown during the birth of my son/daughter. It was a very long and painful labor, but you handled it with loving expertise. Going through childbirth is a mix of immense pain followed by immense happiness. In this journey, the presence of a wonderful doctor is simply priceless. Thanks, doctor, for comforting me and taking away all my stress. Thank you for the excellent care you gave to my child when I especially during the last month prior to his birth. You are truly an amazing doctor for clarifying all the possible options we had for a complicated case of my pregnancy. Thank you for your exceptional care and for taking time to explain to my husband and me the situation surrounding my pregnancy and birth. The delivery of my healthy baby boy was because of you. Thanks! Nine months of my pregnancy could have been a nightmare without your medical supervision. Thanks for making my journey to become a mommy nothing less than a dream come true. Thank you for everything you have done to safely deliver my baby. It was a sad moment for us that my baby did not make it, but your compassionate care and advice helped us understand the situation better. I was so happy when I gave birth to my firstborn. Thank you for the pre-natal and post-natal excellent medical services. I am relieved that we are safe in your hands. From the bottom of my heart, thank you. 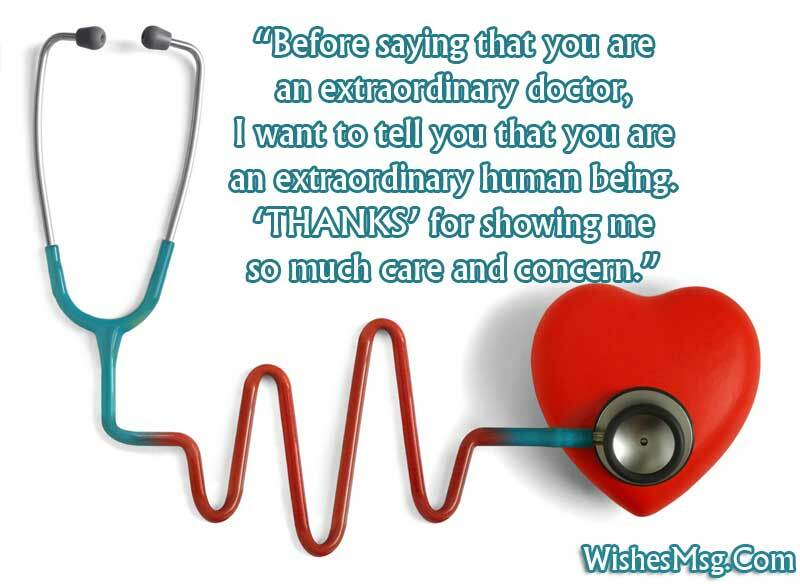 Thank you for being a compassionate doctor. Even if we were under the care of a midwife, you still accepted us at the last moment for an emergency delivery. Thank you for your tremendous skill in performing my operation. Your talent and caring manner is a credit to the medical profession. You are truly a lifesaver. Thank you, again. Until now I associated the word Surgery with Misery. After being under the careful watch of a doctor like you, I associate Surgery with Healthy Recovery. Thanks, doctor. I will never forget the doctor who always smiles in the hospital room when I was admitted for an operation. Your bright aura brings so much joy and inner healing. I always thought that surgeons were haughty, arrogant and self-obsessed. Thanks for proving that they are the exact opposites. I still remember the day when I was admitted to your hospital for surgery. It was one of the toughest times of my life. Your personal attention and kindness helped me overcome my fears about surgery. Thanks for your support! Surgeons like you are not just doctors, but real life-savers. I may not have talked to God in my prayers, but in your services, I have seen some of His favors. Thanks. Thank you for your excellent work while performing surgery on me for [condition]. Your hands are skilled as my incision is very small and my pain has been minimal during recovery. I will be recommending you to everyone I know who also as [condition]. If you have a good understanding with your doctor and connected with him/her in social media then you may send thank you message for the doctor on Facebook, Pinterest or Twitter. And if you have a regular or family doctor then don’t forget to wish and send special thanks on Doctors Day, your thankfulness will motivate them to carry on the caring attitude even in the tough situation.